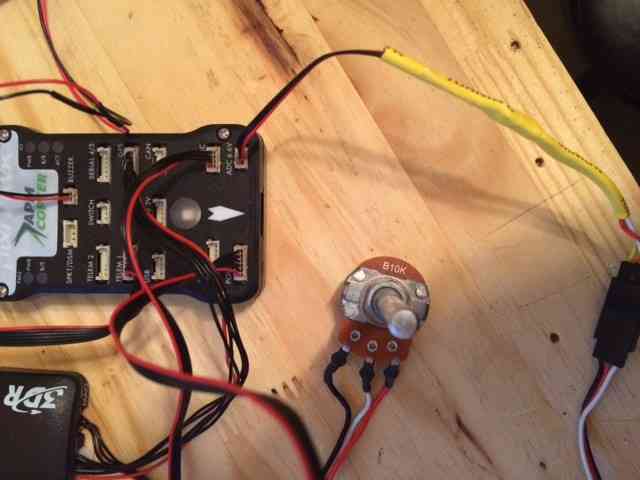 This article explains how you can use a potentiometer with Pixhawk in order to simulate the input from an Airspeed Sensor. This is very useful for ground testing. If your aerodynamic surfaces (i.e. auto flaps, ailerons, elevators, elevons, etc.) are geared or actuated with airspeed, it may be helpful to ground test them on your aircraft by sending Pixhawk a specific airspeed. 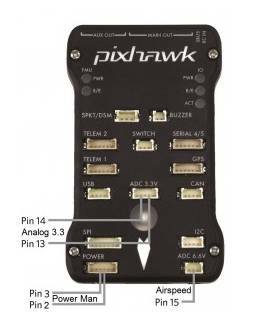 On Pixhawk you can plug a potentiometer into ADC 6.6v (pin 15) or ADC 3.3v (pin 11). If you are using an I2C airpseed sensor you will temporarily configure your autopilot to use the analogue port. You will need this DF-13 cable, and a simple potentiometer like this or this. Either a B10K and B5K potentiometer can be used to set speed from 0 to as much as 90 m/s. Once the DF 13 cable is connected to the potentiometer, plug it into the ADC 6.6v port. 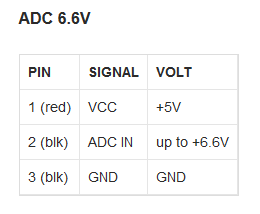 Open your Ground Control Station (GCS) of choice, and change the ARSPD_PIN parameter to Pin “15” as shown below. Reboot your Pixhawk to allow this parameter change to have an effect. Airspeed will reset to 1-3 m/s after the restart and initialization is complete. Adjust the pot to set your desired speed. If you are using an I2C airspeed sensor - remember to re-enable it! 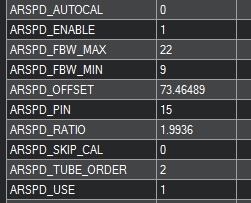 Set the ARSPD_PIN parameter to 65, and cycle the Pixhawk power to ensure the I2C airspeed properly initializes. Check you get the normal 1-3 m/s noise on the airspeed display.